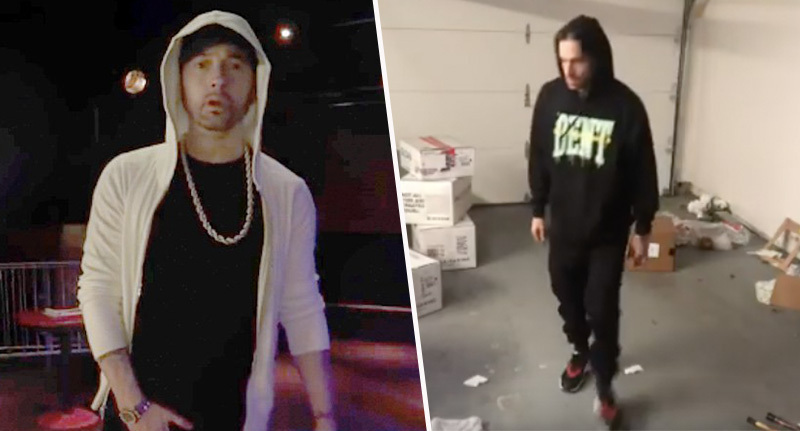 Eminem has spoken out about Chris D’Elia’s ‘incredible’ impression of him, saying he actually thought he was the real Slim Shady for a moment. The comedian was already known for his spot-on impressions of Em, but had never received recognition from the man himself for his impromptu performances. That all changed yesterday (February 5), when Eminem – aka Marshall Mathers – saw D’Elia’s most recent performance and took to Twitter to praise the comedian. Now, I’m not a celebrity nor am I famous in any way, but I can imagine the moment someone does an impression of you is officially the moment you’ve made it. Forget sold out gigs and festivals; everyone knows the true point of fame comes when a comedian does an amazing impression of you rapping in a garage. It’s just science. Em was blown away by D’Elia’s impression – so much so that he needed to let his followers know about it ASAP. Genius. Going all out, D’Elia dresses in a hoodie and paces around a deserted garage, with just a few boxes keeping him company – which he references several times in his rap. He ‘freestyles’, impersonating Em’s gravelly voice and rhyming pretty much anything he can see inside his garage. Which is definitely the whole point of rapping, right? Slim Shady responded by sharing the comedian’s video on Twitter and praising him, describing it as ‘incredible’ and tagging D’Elia in his tweet. This is INCREDIBLE!!! 4 a second I actually thought it WAS me!! Which, y’know, is kinda heartwarming when you think about it. Who else reckons we need more global superstars like Eminem in our lives? Obviously, D’Elia cottoned on pretty quickly that his video had been seen by the Killshot rapper and almost immediately responded to him. Referring to the legendary rapper as the ‘goat’ – aka the Greatest Of All Time – D’Elia called him ‘the man’ for reaching out to him in such a way, and for ‘everything before this’. So it just goes to show kids: if you want to impress your idol or get noticed by them, all you have to do is film a short video of you impersonating them in nigh on identical fashion. That’s not too much to ask, right?